GURREN LAGANN 10 YEAR ANNIVERSARY!! 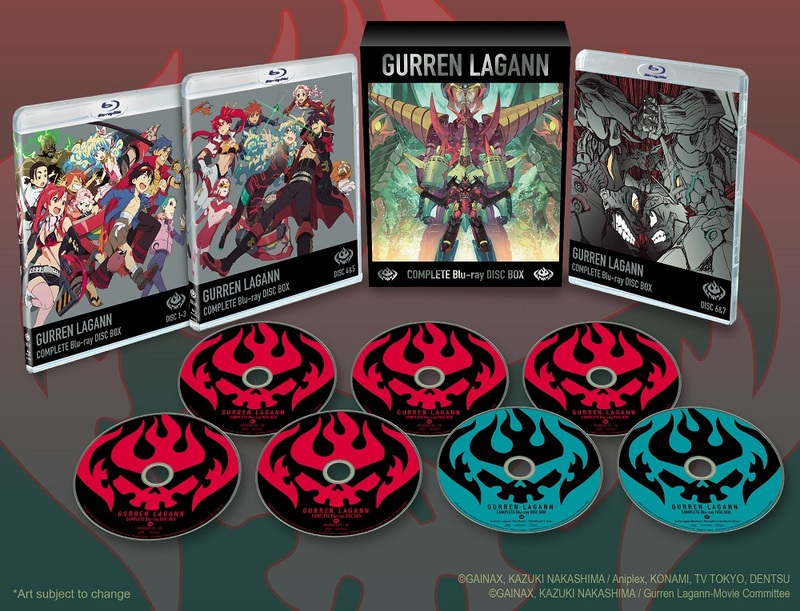 Gurren Lagann returns in a complete TV series and 2 movies in Blu-ray box set. One of the most cherished animation titles lives in your memory forever! Special Features: Episode 6 Broadcast Version, Textless Openings and Endings. Great series, bad aniplex. They charge UK 60-70 usd for this exact item lol. Unless they include the dvd version and atleast 4 goodies, for this price aniplex is really over charging. I'd buy this at 80 bucks easy, maybe even 100 but 150 usd come on! Geraldo ^ is right. All together with shipping from Amazon UK, this is only 90 dollars, or less if buying used. Problem with it is the region coding. So unless you have a region free player, it will do you no good. Cool box and fantastic show though! Why must American citizens pay unfair prices when other countries are charging half, if not even lesser than half!!! Please inform the customers why they are paying so much money for anime blu ray in America. Japanse company in america with japanese business model, less for more. I remember when Aniplex first re-released Gurren Lagann in North America and it was $500!!! I still own the original 6 volumes on DVD, and even though the it's being re-released again with the movies...$160 is way too steep a price to pay no matter how good the show is. If you really want Gurren Lagann, it's way cheaper to import a copy from Australia and buy an all region DVD player at walmart then to but just this product. Why Aniplex is still functioning as a company is beyond all logic, let alone why people like getting ripped off. This is one of the best anime out there, without a doubt. However, the MSRP of $189.99 is simply absurd. 26 episodes and 2 movies is a lot of content. And the content is really good. But compare to other shows, and you will see that the price is too high. The first US release of Jojo has a MSRP of $69.99 for 26 episodes and contains an art book and cards. 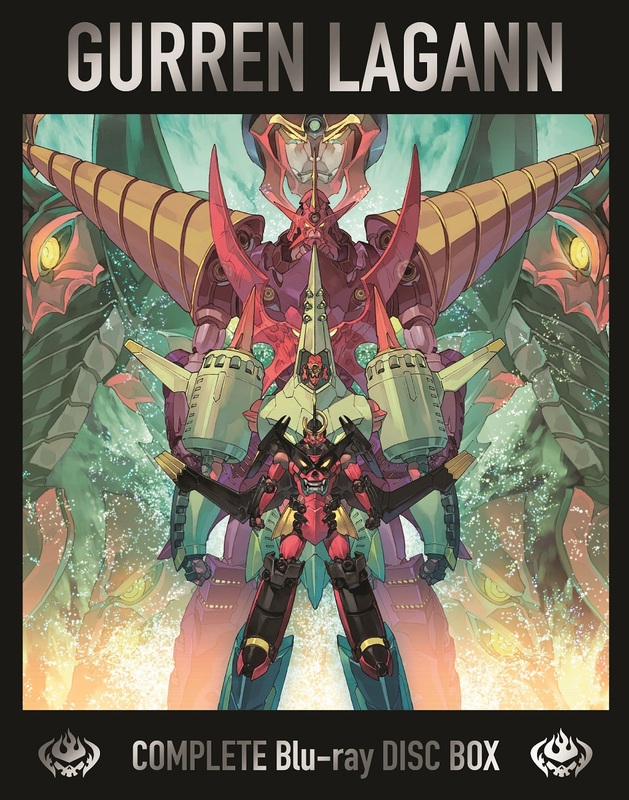 If this Gurren Lagann release had a similar price point, I'd buy it instantly. Sadly, Aniplex's obscene pricing means I can't justify picking this up. Come on... the show is 10 years old at this point!! Just who the hell do you think we are?? This is a fantastic series and the price is in the range I can afford so I'm going to preorder it. Thanks Aniplex! I don't want or care about collectors editions so this is a nice change in the right direction. It's still a bit expensive thought. Great show, decent enough price given the company. Considering that the old boxed set cost $550, and then the single BDs cost 50 bucks each, this release that gives you the entire series and the 2 movies for 150 is maybe the biggest bargain Aniplex will ever give us. and for a show as great as Gurren Lagann, it's honestly a fair price. I'll own this set soon enough. The price, based on the fact that these are the US Blu Ray discs, is MUCH better than the $250 equivalent you would pay for JUST the US BDs. Those complaining about the "original price" of the other box set fail to realize that the box that was released was an IMPORT. This means you were paying the Japanese equivalent price for the set NOT local pricing. THIS is Aniplex's "local pricing" priced box set. You are also missing out on several of the extras included in the original Japanese import set that was sold by Aniplex. This is not a like for like comparison. Expensive? Yes. Less expensive than buying the singles? By a LOT. As someone who has been buying Aniplex of America Blu-rays for years now, I can wholeheartedly say that for anyone who is hesitant to buy this series on Blu-ray, at least as far as localized releases go, this is probably as good as it gets. Taking up less real-estate than the singles and the insanely priced import edition, this will probably end up saving you the most space in the long run. While lacking in the extras, buying the singles (including the films) would end up costing you nearly double and buying the import (which has the most extras) would end up costing you over 4 times as much. In short, this edition by far is the cheapest buying option for a LOCALIZED Blu-ray release. I am not defending AoA's business model, however complaining about their price points at this day and age is a moot point. Obviously, people are willing to buy their shows or else they wouldn't be priced that way nor would they re-release titles for cheaper. Great series and really not a bad price. Great Series, even 10 years later! I'm loathe to defend Aniplex and their pricing in any form.. but look at it this way... the TV series is 27 episodes long.. that is 2 seasons... plus 2 movies... the average going rate for a 12 episode series (1 cour) is about $50 for most on blu-ray.. So you have a 2 seasons at $100 and 2 movies @ $25 each.. you get $150 and it's the current sales price I am buying it at. I own the mangas the limited edition dvd box set that was like 150$ I believe. I also own the movies and limited edition volume 1 box. This is over priced for something not even limited edition. The Blu-ray 500$ one was way way over priced but this? This is practically the same thing with less this is why I've given up with anime/manga such an overcharge, milking a good series for every dime and it doesn't even hold any true value. Gurren Lagann is, by far, my favorite series. It truly is an epic experience on a roller coaster of emotions, topped with unparalleled action sequences. Because of this, I had to buy it, even at $150. That being said, there is a reason I own 10 times as many series distributed by Funimation than Aniplex. Aniplex bleeds the wallets of western fans dry. For $150 I would expect an artbook and a soundtrack; something to commemorate the 10th anniversary of the series. But it is just the series and the two movies. I'm happy to own them, but a fair price for this set would be $60-$70. I can't believe Aniplex had the guts to sell a series that is available on Netflix and Hulu for $150. In another disgusting display of greed, Aniplex pulled the two Gurren Lagann movies from Amazon and iTunes along with the blu-ray double feature in anticipation for this release. Spending $150 on this set is the only way to legally purchase the movies at this point in time. The problem with Aniplex (and Sony) is that the price of the Blu-Ray's are $50 USD (each containing 4-5 episodes) per disk. The price is typical for people in Japan, but the company believes that the world needs to pay something similar even though it is 10 years old. It is the only way to get the 2 movies as well (which costs $70 on Aniplex's website). Funimation being bought out by Sony might be the worst news for fans. The anime is a classic coming of age story. A Gainax classic albeit some of the staff now work at Studio Trigger. Great totally worth the buying. To start off truthfully i always said aniplex had high prices. However.... The packaging of the product is amazing. The boxset that houses the blu ray cases is very well made, and overall looks amazing... the blu ray cases and covers are awesome... the cases theirself arent cheaply made or paperthin like other series. The quality is worth the price. Overall the product is wroth buying, even with the price. Shipping and ordering it. At the time i placed the order my internet was down. So it was done by phone... the lady helping was extremely nice, and helpful. So it made stuff easy, and truthfully the costumer service is why i do all pre orders through this site... shipping amazing... got it a lot sooner then expected.... tracking was showing it wasn't going to arrive until today. It came Monday. So overall product i give a 10 and costumer service i also give a 10. Will definitely make more orders here... :) well have 3 items pre ordered. Pierce the Heaven with this drill of a set! Expensive, the UK release was so much more worth it, it was cheaper and it looked 10 times better. This release is very ugly, the black border and the overall design makes me think Aniplex hate their own fans, by giving them an ugly box design. Price is obviously very inflated. You should be ashamed if you support such poor business practices, AOA need to go bankrupt. Happy 10th Anniverssary Gurren Lagann!!!! Got the DVD version of this show years ago from Bandai for thirty bucks. Aniplex is crazy if they think I'm going to upgrade to blu ray for FIVE times that price! Gurren Lagann is a modern classic everyone should see. The price may be high, but you are getting 27 episode and 2 movies. Box is gorgeous and worth showing off. Recommended. "Video games are so expensive to make!" What about anime? I love this show for what it was and how influential it was. I am a little confused why a ten year old series is being priced at almost $200. I know about how anime has gotten more expensive to make (see all the current anime prices), but this was released disc by disc for much less. Also the copyright has KONAMI mentioned for some reason, excuse me? I don't seem to remember any kind of KONAMI game that had Gainax related content. Either way, I shouldn't be too worried; they were selling the Tengen Toppa edition for $500, this seems to be the lesser of two evils. The anime itself is amazing for a pre-TRIGGER work, so I'd highly suggest it... just wait for the right time to buy. If you're even considering buying this series at the current asking price then you more than likely already know of its legendary status for yourself and are more curious about the release itself. Personally I'm someone who doesn't mind spending a considerable sum for a series I love especially if it's in an impressive sleek box set that looks nice on display and this release genuinely captures both those sentiments very nicely. If you have the money, want a physical copy of the show, and would like to support its creators and distributors while getting something that also brightens up your collection and stands out then this release is for you like it was for me. It would have been really nice if it came with an ost though. My Favorite Anime Of All Time! I love everything about this anime, it’s characters, story, and animation. The Blu-rays are high-quality 50GB discs and the show looks better than some of the newer HD anime that’s released on Blu-ray. The Box set also includes an uncut version of episode 6 and also includes the textless op and ending sequences. This is an amazing anime and literally made me cry, you should definitely give it a try.